Lowell was a small community named Bloomington. 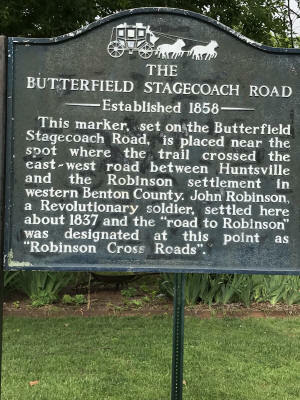 It was located along Old Wire Road where the Butterfield Stagecoach stopped. Bloomington was known as "Mudtown" by many early travelers due to their wagons getting stuck in the muck and having to be pulled out. In the Spring of 1881, the community of Bloomington moved a short distance west to be along the new railroad. This new town was officially named Lowell. The nickname "Mudtown" had stuck with the community ever since. People ask, "Where does the name "Mudtown Days" come from?" This long ago story gathered from local lore and lifelong residents Elza Tucker and Gene Graham contributed to the explanation. According to local legend, "Mudtown" was a nickname for the little town of Bloomington, which was on Old Wire Road about a mile east of where the town of Lowell is now located. 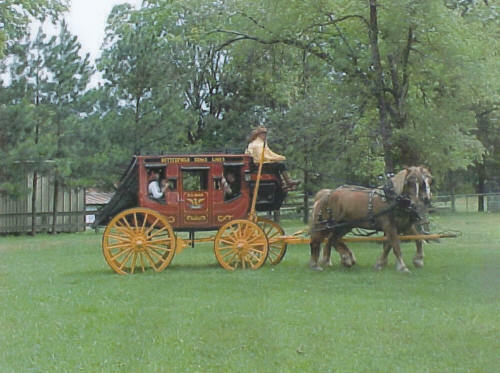 In order to make stagecoaches stay longer, someone would make it especially muddy so that the stagecoach would get stuck. Legend says that a new driver for the Overland Butterfield Stage gave it that name when he came out of Alex nail's Tavern and Dram Shop and found that the stage had sunk into the mud up to the coach bed while he and his passengers were refreshing themselves. Mudtown residents blamed the muddy ruts on the heavy lumber wagons which hauled rough pine lumber from Van Winkle's Sawmill, which was some fifteen miles east of Rogers, to the towns of Springdale and Fayetteville. The first post office in Bloomington began operation in 1856 but there was a settlement along Old Wire Road many years before that time. In a diary of Dr. William Isaac Irvin Morrows, "Trail of Tears", he wrote: "Wednesday, March 20, 1839 - Traveled 15 miles to Cross (X) Hollows. Ate dinner at Homedy's and came on five miles to Fitzgeralds. A mean House." The Old Wire Road was a busy road. It was the principal North-South road of the region for freight wagons and was on the main line of the Butterfield Stage. Traveling salesmen (known as drummers) tied their horses at the hitching rack then visited the tavern for refreshment. Afterward they dropped into the general store to replenish their supplies for anything from cheese and crackers to horseshoes and chewing tobacco since the store sold everything. 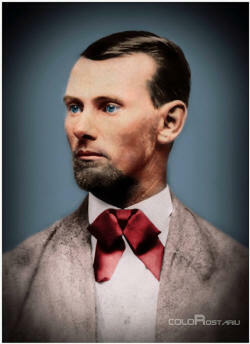 Across the road from the Nail Tavern was the Bloomington Hotel where Jesse James spent most of one winter, safe across the state line from Missouri Sheriffs. No one worried about Jesse James being a frequent visitor to the town until 1928 when the Bank of Lowell was robbed. Mudtown had a hotel, church, schoolhouse, Tavern and Dram Shop, a general Store (which was also the post office), blacksmith shop, and a camping area for horse traders...but no bank until 1881. During the Civil War (1861-1865), both sides used the horse traders area as an Army Camp. On November 29, 1861, a Confederate Army of more than 10,000 soldiers under General Ben McCullough moved into winter quarters one mile north of Cross Hollows. A muddy road was not unhealthy. Uncle Alec Nail died January 24, 1920 at the age of 103. At his funeral, the preacher said that Uncle Alec would have lived to a ripe old age if he didn't take a nip of whiskey each morning before breakfast. The widow, Henrietta Nail, could stand on her front porch and see the lights of her eight sons' houses along Old Wire Road. There was no joy in "Mudtown" when the word came that the Frisco Railroad would be built one mile west of town. The railroad was completed in 1881 and Mudtown talked about moving, but nothing was done for several months. About that time a cyclone came along and decided the question. The buildings left by the cyclone were moved, and Bloomington changed its name to Lowell. The railroad depot was later moved to Oklahoma. 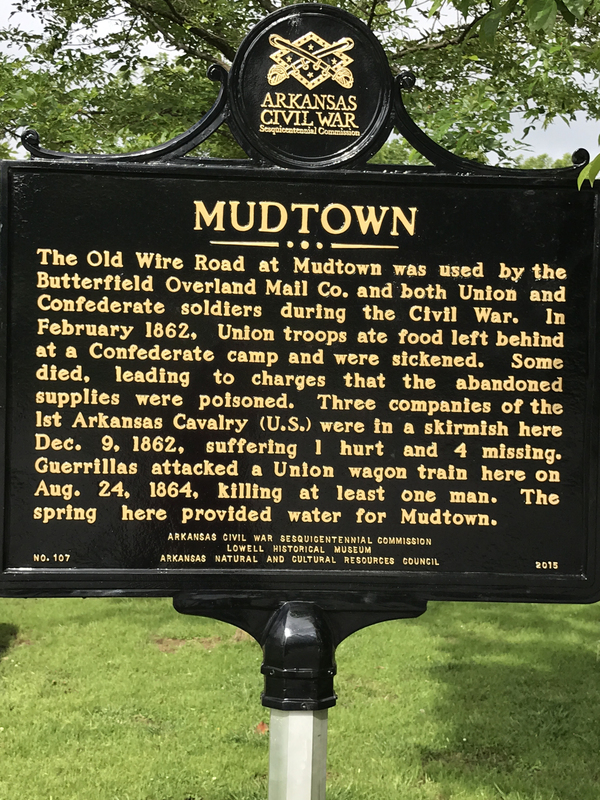 Find out more about the history of Mudtown. Visit the Lowell Historical Museum at the Intersection of Jackson and McClure.